Bill started his career as a divorce attorney. He soon gained national attention for his ability to take the conflict out of divorce. Fifteen percent of his clients never divorced, and the ones who did were able to part as friends. His focus was on healing relationships. He showed his clients how to end the conflict and the restore love, not as husband and wife, but as one human being to another. Media across the country affectionately call him, "The Love Counselor." His book, How To Heal A Painful Relationship, has become a national best seller. 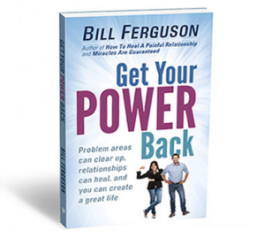 He is also the author of Get Your Power Back and Miracles Are Guaranteed. The Texas Counseling Association thinks so highly of his work that they asked him to deliver the keynote address at their annual convention. He taught his concepts to over 2,300 counselors and therapists. Bill discovered that whenever you have a relationship or any other area of life that isn’t working, there will always be an underlying condition of resisting or hanging on that is creating the problem. This condition creates a state of fear, upset, and tunnel vision. It destroys your ability to see clearly and keeps you from finding solutions. Then it forces you to act in a way that actually makes your situation worse. In relationships, it destroys love and creates a destructive cycle of conflict. Every area of life that isn’t working and every self-sabotaging behavior pattern can be traced directly to this underlying condition. Until this condition is found and removed, you will be forced to repeat the past and the area of suffering will continue. Have people discover the underlying conditions that destroy love and keep their lives from working. Walk people through the process of finding and actually removing these destructive underlying conditions. Show people how to end conflict, heal hurt, and restore love in every relationship and every aspect of life. Give people the tools, the awareness, and the support they need to create incredible lives.